Navigating through Continue to Give is fun and easy. This is a step by step guide to help you learn where everything is at! It should automatically log you into your dashboard. To get there from any other page simply click on "My Settings" and then Account Settings in the upper right hand side of your screen. This is your dashboard tabs. These tabs are used to navigate between settings. For example: You have two profile, your personal manager profile and the organization you manage. Both profile have their own dashboard, profile page, projects, settings, etc. 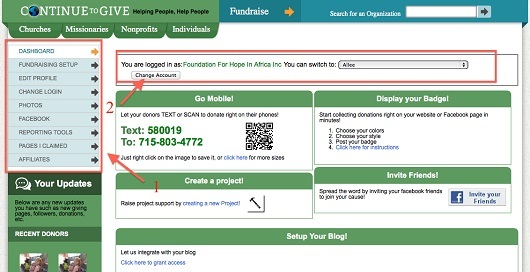 Click on My Settings then your fundraising name on the top right side of your screen. 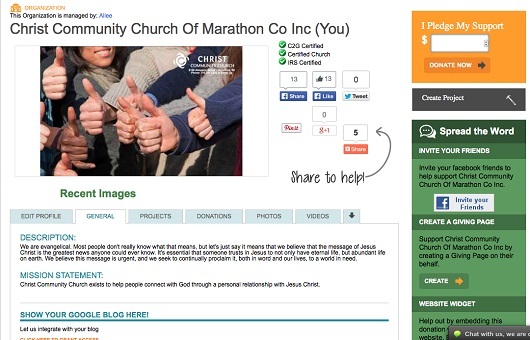 This is your profile page and is viewable to the public and is your online fundraising websites. You have a profile page for your admin profile, your organization's profile, your giving pages, missionaries, and every project you create. Each will have a picture, a description, a place to give, and a comment board. The vertical banner on the right side of the screen is where you can go to get your QR code, Text to Donate number, and website widgets to go on your facebook and organizations website.